It's Book Club this Friday. We meet in a café, buy drinks, and talk about books. 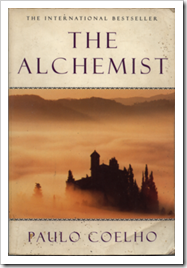 On the basis of another member's recommendation, this month we've read The Alchemist, by Paulo Coelho. Hence this review. I've got at least one good thing to say about it. It's short. I guess I can also be slightly positive in that the book wasn't difficult to read. It wasn't well-written, but it was at least readable. For a while, I was interested in what would happen to the main character, an unnamed 'boy' who starts as a shepherd in Spain and who travels across North Africa in pursuit of his "Personal Legend" (BLERGH). I guess the first two thirds are slightly plot-driven and so more tolerable. Then you get to the bit where the boy is communing with the desert and discovering the Soul of the World and listening to his heart and becoming friends with his heart and being congratulated by an alchemist for pursuing his Personal Legend and learning that it is we who nourish the Soul of the World, et cetera, et cetera. I just can't write any more because it's too painful. GAH. The Alchemist is deeply depressing, as yet another example of a terrible book which has somehow made its author famous and rich. One star from me - and that's being generous. At least I've got out the worst of my spleen. Now I have to work on being polite about the book on Friday. Hello Allie! It's me!! :D I just decided to see your blogs after deciding to see what Anna and John are up to! :) I used to really like Paulo Cohelho's books when I was a bit of a post-modern new-ageist in my teens... I thought his books got me thinking on some interesting questions and things in life... But yes I have to admit, when I read the Alchemist as a mature 20s, I found it quite underwhelming....Have you read "Veronica decides to die"? I had a strong impression when I read it in my teen. I wonder if I find it similarly disappointing if I read it again..
Hi Dawn!!! Yay! I haven't read Veronica decides to die - I just really hated this one so much that I wouldn't really pick up another Coelho novel, sadly... but it might be that he's written other good ones! Are you reading anything good right now?